Different countries celebrate Easter in different ways – from easter trees to dancing around eggs, we take a look at some of the unusual and interesting traditions. EASTER TRADITIONS VARY around the world – from dyeing eggs to dancing around them. In some countries, huge processions take place, while in others the religious celebration is marked in more sedate ways. We take a look at some of the most interesting traditions worldwide. People often prepared for the coming of Easter by spring cleaning their home, buying new clothes and cutting hair and fingernails. In the past, a mock funeral for a herring would be held on Easter Saturday, which marked the end of the Lenten period where Catholics would abstain from eating red meat. Traditional folk dancing called Morris dancing takes place over Easter. Easter bonnets were popular, especially in times past, when women would make and wear their own bonnets.. Hot cross buns are served on Good Friday, while Simnel cake was served on Easter Sunday to help break the Lenten fast. Maundy Thursday is celebrated by Christians on the Thursday before Easter, and includes blessing of holy oils and often the washing of the feet. The Monarch offers ‘alms’ or coins to senior citizens. A game called ‘egg tapping’ is sometimes played in the North of England, where players hit other players’ eggs and the winner is the one whose egg breaks last. The Easter Bunny also visits Germany, and decorated eggs are popular here. The summer day parade, or Sommertagszug, is celebrated three weeks before Easter. The Easter market (Ostermarket) also takes place, where people can pick up Easter-themed products and crafts. The Osterbrunnen is an Easter fountain – you’ll find it in Franken in Germany, and it involves decorating a fountain with garlands and decorated eggs. The ‘egg dance’ is often played – eggs are laid on the ground and people dance among them while trying not to damage them. An Easter festival is held in Antigua, a tradition brought to the country by Spanish missionaries in the 1700s. It involves a week of celebrations, including a procession travelling through the town. 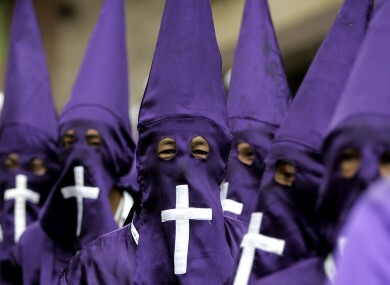 Similar processions take place in Colombia, where the Nazarenos wear purple hooded robes decorated with white crosses. The crucifixion of Christ is renacted in the Philippines at Easter time. This practice is not encouraged by the church but takes place on Good Friday and involves the real-life nailing to the cross of volunteers. Easter is celebrated in dramatic ways throughout Spain, from processions of religious statues to the drum chorus in Calanda. Holy Week is called Semana Santa, and Semana Santa in Andalucia sees the ‘nazarenos’ in traditional hoods and masks following processions. The Danza de la Muerte (Dance of Death) takes place in Verges, Gerona, on Holy Thursday and harks back to the Black Death in the 14th century. It involves five people dressed as skeletons touring the town and scaring many in their path. In Florence, the Easter Sunday celebration involves a parade through the town, during which a cart is exploded to help ensure a good harvest. Easter processions are also popular in Italy, with confraternities in traditional costumes journeying through the streets and brass bands playing in Enna in Sicily. Dyeing Easter eggs is popular here, a tradition that is also carried out around the world. Do you have any family Easter rituals? Email “Easter: Fascinating traditions around the world”. Feedback on “Easter: Fascinating traditions around the world”.